The recommendations were reached by majority vote of the Assembly members following two weekends of deliberation. 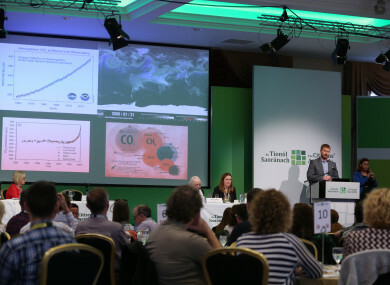 THE CITIZENS’ ASSEMBLY has approved and published a report which makes a number of recommendations on how Ireland should tackle climate change, such as higher taxes and increased public transport. The “How the State can make Ireland a leader in tackling climate change” report has been laid before the Houses of the Oireachtas today. The recommendations were reached by majority vote of the Assembly members following two weekends of deliberation which focused on a broad range of issues, including the science of climate change, current efforts to tackle it in Ireland and internationally, transport policy in Ireland and current agriculture policy. 97% of members recommended that the State should end all subsidies for peat extraction and instead spend that money on peat bog restoration and make proper provision for the protection of the rights of the workers impacted with the majority 61% recommending that the State should end all subsidies on a phased basis over 5 years. 93% of members recommended that the number of bus lanes, cycle lanes and park and ride facilities should be greatly increased in the next five years, and much greater priority should be given to these modes over private car use. 92% of members recommended that the State should prioritise the expansion of public transport spending over new road infrastructure spending at a ratio of no less than 2-to-1 to facilitate the broader availability and uptake of public transport options with attention to rural areas. 89% of members recommended that there should be a tax on greenhouse gas emissions from agriculture. There should be rewards for the farmer for land management that sequesters carbon. Any resulting revenue should be reinvested to support climate-friendly agricultural practices. 99 % of members recommended that the State should review, and revise supports for land use diversification with attention to supports for planting forests and encouraging organic farming. In her introduction to the report, the chair of the Assembly, Mary Laffoy, said: “It was implicit in the mandate in the Oireachtas Resolution that climate change was real, happening and must be tackled. The deliberations of the Assembly, therefore, focused on how the State could best meet that challenge. Just over 1,200 submissions were received by the Assembly on this topic, according to Laffoy. The Green Party has welcomed the publication of the report, saying that the findings endorse the urgent need for strong climate action, led by the government. Speaking today, Green Party leader Eamon Ryan called on the government to address the issues raised in the report. “The report highlights the benefits that going green would mean for our country. All that’s lacking is the political will. The longer the government stalls on taking radical action, the worse it is for the economic and environmental future of our country,” Ryan said. Meanwhile, Irish Farmers’ Association president Joe Healy has said the carbon tax proposal is a “no-go”, but there are other recommendations that could reduce carbon in the national economy. Healy said increasing carbon charge on farming would just continue a “failed policy” of more taxes without delivering any reduction in national admission. He has called on all stakeholders to move on from the calls for Irish farmers to reduce their emission efficient model of dairy and beef production, something the IFA has called divisive and unrealistic. “Farming has a real role to play in the carbon debate and the decarbonisation of the energy sector, through the mobilisation of our land resources for renewable heat, transport and electricity production,” Healy said. Email “The Citizens' Assembly publishes report calling on Ireland to be 'a leader in tackling climate change'”. Feedback on “The Citizens' Assembly publishes report calling on Ireland to be 'a leader in tackling climate change'”.